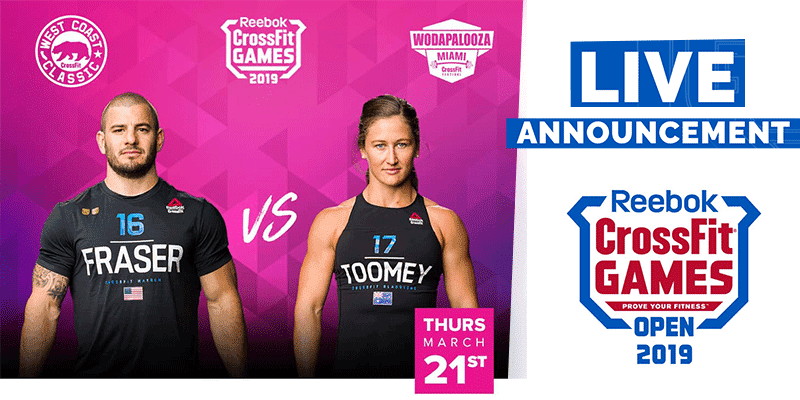 The CrossFit Open Workout 19.5 live announcement will be a clash of champions, Mat Fraser vs Tia Clair Toomey. This is the battle that everyone has been waiting for! Tia won the 2017 and 2018 CrossFit Games. She competed in the women’s 58 kg event at the 2018 Commonwealth Games in the Gold Coast and won gold. She also competed at The Olympics in Rio in 2016, finishing in 14th. This was only weeks after placing second at the 2016 CrossFit Games. Mat Fraser is the unstoppable dominant Juggernaut in CrossFit right now. He has won The CrossFit Games for the last 3 years running, and he has a formidable background of strength and weightlifting. This gives him a tremendous advantage over many of his other competitors. On the day he graduated from high school he moved to Colorado and began to train full time as an Olympic Weightlifter. Within one year he was Snatching 130kg and Clean and Jerking 160kg (at 77kg bodyweight). Who do you think will win? Toomey or Fraser?